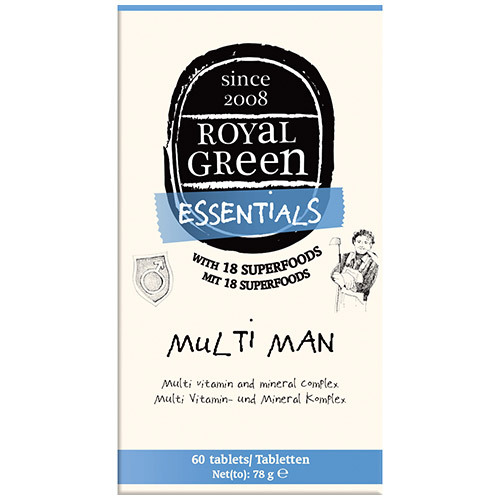 Royal Green Multi Man delivers essential vitamins and minerals that a man needs in the form of food. At least 97.5% of the specially selected nutrients in Royal Green Multi Man are certified organic and grown without the use of pesticides! Get all the essential vitamins and minerals you need in this specially formulated vitamin and mineral complex for men. The unique mix of superfoods (that`s 18 to be exact), herbs and mushrooms combined with important vitamins like D3, A, C E and B make up everything you need to support the immune system, enhance power, energy and provide optimal protection against nasty free radicals. Jerusalem artichoke (Helianthus tuberosus), tapioca starch, calcium (from eggshell), vitamin C, tomato juice powder, bladderwrack, anti-caking agent:beeswax, american ginseng, black currant, bilberry, pomegranate, rhodiola extract, green tea extract, asian ginseng, siberian ginseng, spirulina, vitamin E, zinc, ginger extract, grape seed extract, turmeric, vitamin B5, vitamin B3, vitamin B1, vitamin B6, vitamin B12, reishi, cordyceps, maitake, shiitake, manganese, copper, vitamin A, folate, chromium, selenium (from mustard seed), molybdenum, biotin, vitamin K2, vitamin D3, vitamin B12. 2-4 tablets a day, preferably 1 in the morning and 1 in the evening on an empty stomach. Below are reviews of Royal Green Multi Man - 60 Tablets by bodykind customers. If you have tried this product we'd love to hear what you think so please leave a review. Excellent multivitamin and most importantly all certified organic. Will definitely repeat. Royal Green Multi Man delivers essential vitamins and minerals that a man needs in the form of food. At least 97.5% of the specially selected nutrients in Royal Green Multi Man are certified organic and grown without the use of pesticides!